During this session we met at a park in Bethel, CT. The parents brought baloons to make this more interesting for their little one. I am always very happy when parents are involved in their session and try to engage their child. You can tell by her expression that she really enjoyed her photoshoot. How to get my child smile when I take a picture? The answer is really simple. Engage them in doing something so that they forget the whole attention is on them. Here, the little girl's dad handed her the baloons and her mom, who was standing behind me, called her to come to us. 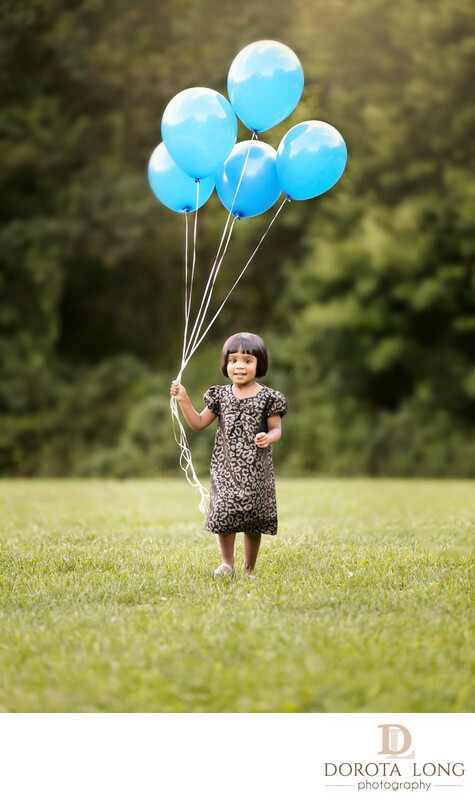 The little girl was so happy to hold the baloons that you can still see the big smile on her face. I was waiting for this moment with my camera ready and my lens with the right settings. When taking children's portraits it is very important to have your gear ready and be very alert to what is going on. Knowing children and having two of my own, I know that that perfect moment may come any minute and will not be possible to recreate. The picture of a happy child like this, printed on a large canvas is what my clients like to hang on their walls after each session.